Software licensed under the terms of the GPL 3 license. 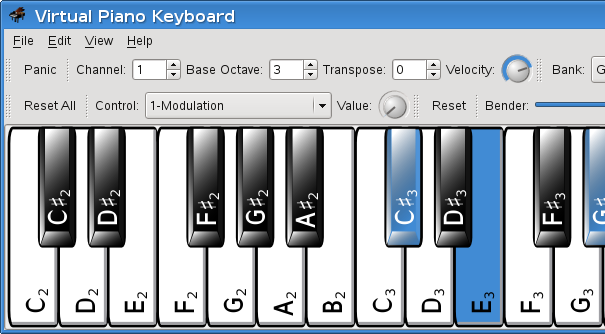 RtMidi 1.0.15 patched by Gilles Filippini enabling several MIDI drivers to be compiled at once, and allowing the user to select one at runtime. Fixed Bug #3503768. Removing the shortcut for an action having default shortcut keys, the change is not saved upon exit, so the shortcut appears again the next execution. Fixed Bug #3502659. Saved preferences not set correctly. New implementation of the Network MIDI driver (UDP multicast). Independently enable/disable note input using keyboard, mouse, and touch screen. Note highlight color policies (single, double, one color for each MIDI channel, one color for each grade in the chromatic scale). Color palettes editor dialog. Option to show a colorized scale. XML comments within keyboard map files are allowed. Touch screen support (multi-touch) if it is supported by the OS and hardware. RtMIDI-1.0.14 with Jack MIDI support. New network MIDI driver (UDP multicast) compatible with IpMIDI and QmidiNet. New translations: Dutch by Wouter Reckman, and Swedish by Magnus Johansson. Fixed a crash when changing the octave base while channel is 10. RTMIDI_DRIVER: selects the RtMIDI backend. Default depends on the OS. Allowed values: ALSA, JACK, COREMIDI, IRIX, WINMM, NET. PROGRAM_NAME: selects the executable name. Process incoming controller events: all sounds/notes off, and reset controllers.